Oriental Empires is still in Early Access, but from what I’ve played so far of the ambitious 4X strategy game—which blends elements of the Total War and Civilization series—I see a lot of promise. The influence of the former is clear not only from screenshots, but from playing the game. It just feels like a Total War—or at least its strategic section—from the camera angle to the world map to the way the game’s menu and interface are structured. Anyone who has played any of the recent Total War games will be right at home clicking their way around the basics here. That’ll only get them so far, though, because Oriental Empires isn’t just a straight military strategy title, it’s a full blown 4X game, infusing Creative Assembly’s basic template with stuff like city-founding, extensive construction options and a more complex research tree. Which sounds ambitious as hell, considering that kind of experience would be top of most strategy fans’ wishlists, but...the foundations are there to do something fun with it. Not with the blockbluster flair of Total War, or the machine-honed balance of Civilization, but...a lot better than you’d have expected for a tiny studio that you’ve never heard of. There’s a reason I keep mentioning Total War here. 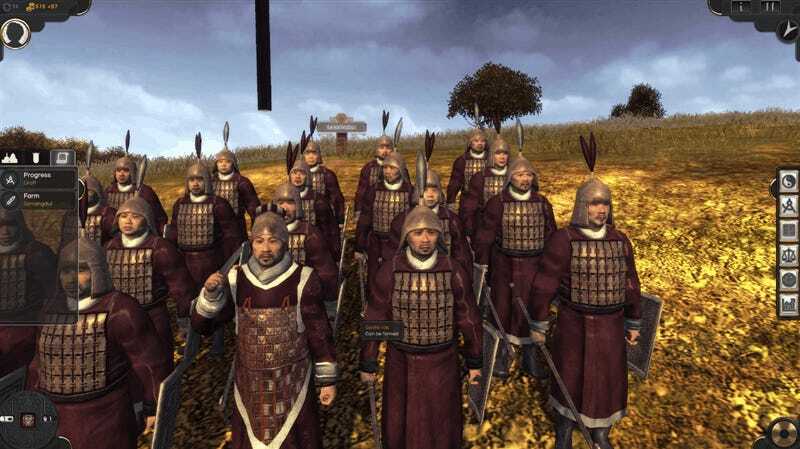 Yes, the influences are obvious, but there’s good cause; Oriental Empires’ two leads used to work at Creative Assembly on the Total War series, so forgive them for sticking with what they know (and think they can improve on). The coolest fusion of the two series is in combat. There’s no division between the strategic and the tactical here. Your units are represented in scale on the map, meaning every one consists of dozens (or sometimes hundreds) of little dudes running around the overworld in real time, and when they fight, they duke it out right there. No separate loading screen, no new controls, it’s all right there. The advantage of this is that it looks amazing. It also means that moving units on the overworld takes an unusual amount of skill and strategy, because you execute ambushes and flanks on the map itself (see below), not on a battle screen. 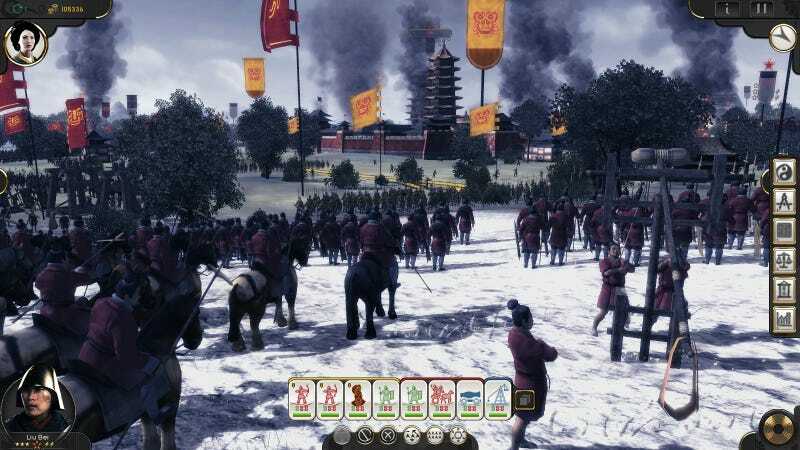 The disadvantage is that aside from the larger manoeuvring concerns it removes a lot of the faster, more immediate small-scale tactics that you might be getting psyched for given the Total War influence everywhere else, but then, this is Oriental Empires, not Total War: China. One last thing I really like is the way player moves are handled and calculated. Rather than taking it in turns, every player plots out their army movements and build orders in advance. When you hit the end turn button, every player’s actions are then processed simultaneously; if two armies run into one another, they fight, which sounds messy, but is actually a neat way of handling things like ambushes and retreats. Oriental Empires is out now on Early Access. The devs say that the version is “almost complete” in terms of the singleplayer experience, with only work needing to be done on multipleyer. That’s a little disappointing since the game’s presentation is a bit washed out and under-done, and the tutorial was pretty much broken, but until it hits final release I guess everything is subject to change.